The premise is simple but brilliant: one day the earth's rotation begins to slow; from that point things rapidly degenerate, endangering all life on earth. It starts with birds falling from the sky, the earth's gravity thrown off, confusing their internal system of navigation. It only worsens as the planet continues shifting and changing. The story is told from the perspective of a young girl named Julia, around 11 years old when it all begins. Her parents – a father who's an obstetrician, her mother an aging former actress – partially due to an effect from "the sickness" associated with "the slowing," watch their marriage disintegrate as they grow further and further apart. Meanwhile, despite the increasingly dire conditions, children remain children. Julia struggles to grow into maturity enduring the ups and downs of budding adolescence, suffering through the politics of middle school. Everyone else loves the book; that's what I'm hearing from all corners of the literary world. Praise is generous, though if you read the acknowledgments it quickly becomes clear a high number of cover blurbs were written by her writing teachers. Walker has an MFA and is a former editor at Simon & Schuster. She's done everything right; her qualifications are stellar. Unfortunately, her writing skills are poor to forgettable. My problem with the book wasn't the storyline, which is an excellent framework. The flaw is I was seldom moved to feel any of this. What should have been a terrifying tale of man's fragility in the face of forces beyond our control was instead a monotone relation of happenings. All well ordered, mind. For that I give her credit; I just didn't care about her characters, save Julia. "This is not a disaster novel, per se: there are no ticking clocks, no handily placed experts to explain away any confusion, no epic finales. The Age of Miracles is refreshingly, and realistically, human-scaled, less about the disaster facing the world than it is about community, family and growing up. For 11-year-old Julia, the novel’s narrator, the Earth’s rotation may have slowed, but the world keeps on turning." By now I worry I'm crazy, that I missed something pretty much everyone else saw. Are there no negative reviews out there? "The Age of Miracles is a gentle reminder of what adolescents learn and adults try to forget – that the world is alarmingly mysterious and that the talismans of modernity are no defence against the “unimagined, unprepared for” miracles or calamities of love and loss." Karen Thompson Walker is clearly the latest darling of the publishing world. Why I didn't feel it, why it didn't reach me is confusing and a little awkward. 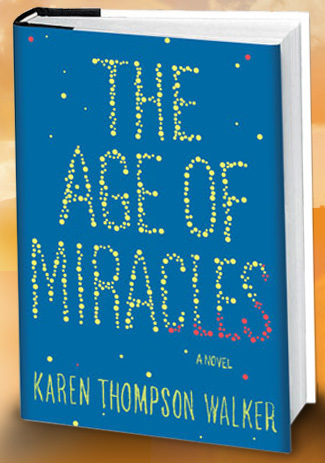 “The Age of Miracles” leaves us, instead, only with the typical tropes of tween anxiety set awkwardly alongside the death of the planet. Poor Julia must somehow cope with a new training bra and the destruction of the human race. That’s enough to make sixth grade a real bummer." "What “The Age of Miracles” would need to work, though, is more consistent quality. Its opening and closing chapters are fairly effective, but the bulk of the novel vacillates erratically between plain and melodramatic. Straining the ordinary pains of adolescence toward profundity, the story slowly winds down long before we get to the End." Ah, what a relief. This is why I can't recommend this novel, an apt observation expressing my thoughts exactly. The novel was detached to the point of boredom, one long slog through the eyes of an 11-year old. If you want to read a truly masterful book on a similar topic, read Meg Rosoff's How I Live Now. Then come back and let me know how you feel about The Age of Miracles. Rosoff's novel is the perfect illustration of how this genre is done right. Over the past three years or so, I’ve noticed that the books that irritate me the most have been written by authors who are normally editors. Coincidence? (I’m sure you can think of some great writers who are editors, right?) By the way, as a Canadian, I treat anything I read in The National Post with caution. Persephone, Now that you mention it, I have read some really vile books written by editors. I wonder why that is? Could it be editors of editors are afraid to critique a peer? Surely the editor him or herself doesn’t self-edit… I hope. I’d have to think a while to come up with really good editor/writers. I know there must be some but don’t ask me which… Overall, I think some of the best prose writers are poets. Not always but very often. I always thought it was because editors know the ins and outs of getting a book published, so are more likely to get in print whether the book is good or not. Persephone, Ah, yes. That makes sense.